The time management matrix will help you identify what you really spend your time on. It’s a particularly useful tool if you want to know how to prioritize work, personal roles, goals and commitments. Popularized by Stephen R. Covey, it’s based on the idea that all your time is spent in a four quadrant matrix. You can’t change the size of this matrix — that’s the time that you have. You can significantly alter the size of the four quadrants within the time matrix. 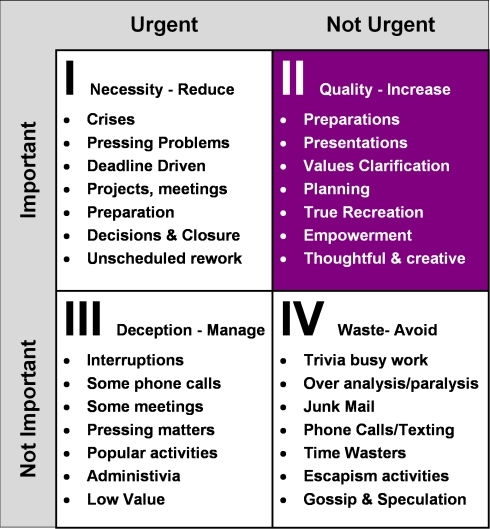 The Quadrant of Necessities – reactive tasks that need to be done, often at the last minute. Crises, ‘fire-fighting’ and looming deadlines are typical examples. The Quadrant of Quality – proactive tasks, often habitual, that maintain or improve the quality of your work and life. The more you expand this quadrant, the more you reduce the other three, particularly ‘pseudo-emergencies’ that should never have been allowed to become so. Examples include maintaining and building relationships, regular exercise, healthy eating or learning new skills, even becoming more aware of the importance of time management itself. The Quadrant of Deception – plenty of people have gone home in the evening wondering where all the time went. Well, it was here! It’s so easy to get sucked into doing things that are the wrong side of the 80-20 rule. Many less than effective meetings, popular activities and easy tasks are probably a waste of your time. Some of the worst culprits? Other people! What are you like at managing interruptions? So, how do you deal with time wasting activities? Learn how to be assertive and say ‘No’. The Quadrant of Waste – you know what it is and you know when you’ve been in it. The trick is to know when you’re init. Often, it starts out as restful time (which is Quadrant 2). The tipping point comes when you spend too long doing mindless things. Wasting time online, TV and excessively long conversations are classic examples. Wasting time is inevitable, but there are strategies for changing bad habits that will help you waste less. You can even learn how to waste time well. The best judge of which quadrant you are in is you. As your awareness improves, you enhance your ability to choose how to spend your time.